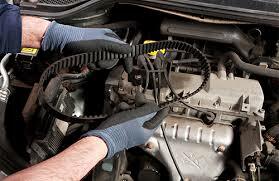 Over time, serpentine belts and radiator hoses require replacement, because they lose their ability to properly expand and contract. In the case of timing belts, teeth that keep the belt in place and functioning properly can snap off or the timing belt may become frayed and loose. One sudden malfunction of these relatively inexpensive but very important parts can have costly consequences.